Day 14 of the 2012 Spring Championship of Online Poker (SCOOP) at PokerStars was a lot like Day 4, Day 7, and Day 10. Shaun "shaundeeb" Deeb won yet another event on Saturday, giving him four wins and eight final tables. Joining Deeb in the winners circle on Day 14 were Luke "lb6121" Schwartz and Mike "Sowerss" Sowers. An impressive field of 134 came to play in the $5,000 PLO 6-max extravaganza, more than doubling the guarantee. Among those making the money but falling short of the final table were Paul "paulgees81" Volpe (9th - $21,775), Jose "nachobarbero" Barbero (12th - $14,405), Jorryt "TheCleaner11" van Hoof (16th - $8,710), and Jesper "KipsterDK" Hougaard (17th - $8,710). About 90 minutes after the final table began, Joe "ender555" Ebanks was the first player eliminated. Down to 11,472 at 2,000/4,000, Ebanks committed his chips with in a three-handed pot. The flop saw action on the side as "MrDurden" bet 12,000. Luke "lb6121" Schwartz called, but folded when the hit the turn following a "MrDurden" shove. Ebanks was well behind the of "MrDurden" and was not saved by the river. Jorge "twin-caracas" Arias was the next to fall, doing so at 2,500/5,000. From the cutoff, Arias shoved for 14,424. "GlassOfBeer" isolated from the button with and was facing the of Arias. The board ran out as Arias' flopped flush draw failed to hit. Fourth place was reserved for "GlassOfBeer." At 3,000/6,000, Nicolas "niccc" Chouity" min-raised to 12,000 on the button. "GlassOfBeer" called from the big blind to see the flop. A check from "GlassOfBeer" led to a bet of 10,850 from Chouity. "GlassOfBeer," though, put in a check-raise all-in for 51,098. Chouity called much of his stack with , and was in fact leading the of "GlassOfBeer." The turn locked up the pot for Chouity with a full house. Nicolas "niccc" Chouity fell a bit later in the level, calling a "MrDurden" button raise to 13,140 from the big blind. A flop fell and Chouity checked. "MrDurden" bet 16,800, only to see Chouity shove for 76,692. A call from "MrDurden" revealed for middle set, while Chouity needed help with . The turn was no help to Chouity, while the river improved "MrDurden" to a full house to set the stage for the heads-up battle. Luke "lb6121" Schwartz held a 377,116 to 292,884 lead at the start and after about an hour, Schwartz locked up the victory. At 5,000/10,000, "MrDurden" opened to 21,234 on the button. Schwartz re-raised to 67,702 from the big blind, resulting in a shove for 137,082 from "MrDurden." Schwartz called with and looked to out flop the of "MrDurden." The board rolled out to secure the SCOOP victory for Schwartz. The "Medium" version of Saturday's short-handed PLO event saw the top 90 finishers make the money. Among those finishing shy of the final table were David "SexSeen" Sands (12th - $4,426.50), Jon "PearlJammer" Turner (14th - $3,064.50), Jesper "KipsterDK" Hougaard (16th - $3,064.50), Sami "Lrslzk" Kelopuro (19th - $2,383.50), James "Andy McLEOD" Obst (22nd - $2,383.50), James "croll103" Carroll (24th - $2,383.50), Ben "Sauce123" Sulsky (29th - $1,974.90), Jamil "Jamil11" Wakil (35th - $1,702.50), Charlie "JIZOINT" Combes (38th - $1,464.15), Raymond Wu (48th - $1,293.90), Mike "SirWatts" Watson (69th - $987.45), Joe "ender555" Ebanks (70th - $987.45), Jorryt "TheCleaner11" van Hoof (73rd - $953.40), Owen "ocrowe" Crowe (75th - $953.40), Dani "supernova9" Stern (77th - $953.40), Dylan "ImaLucSac" Linde ($919.35), and Chris "Genius28" Lee (84th - $919.35). In the end, Mike "Sowerss" Sowers prevailed to claim the SCOOP watch and a better than $61,290 score. The "Low" short-handed PLO event saw a big field of 3,289 play down to a winner in almost 11-and-a-half hours. The event ended with a three-way chop, and by going on to win "LuckyBoxxi" ultimately earned slightly more than the $25,902.68 that had been scheduled to go to the winner. Notable finishes included Chris "ImDaNuts" Oliver (18th - $1,085.37), Ozenc "ozenc" Demir (47th - $386.45), Joep "Pappe_Ruk" van den Bijgaart (50th - $353.56), and Ben "ShankingYou" Palmer (61st - $312.45). The "High" version of the "High Roller" heads-up NLHE event sported a hefty $20,000+$1,000 buy-in, thereby attracting a select group of 28 elite players. Only those making it through Saturday's first day of action and to Sunday's final four would make the cash in this one. That total of 28 entrants meant four players would be lucky enough to draw first-round byes — Viktor "Isildur1" Blom, "akut," Niklas "ragen70" Heinecker and "Serkules." In the first round, "Also11" was the first one to win a spot in the Sweet 16 after taking care of Ben "Ben86" Tollerene in just over 20 minutes. "Eunjong Byun" soon followed suit by eliminating Scott "gunning4you" Seiver. Then over the next half-hour four more Round of 16 spots were claimed: Ben "Sauce123" Sulsky defeated Dan "w00ki3z. Cates," Bertrand "ElkY" Grospellier outlasted "Lotte Lenya," Ankush "pistons87" Mandavia knocked out "Lottenice," and "raidalot" beat Sorel "zangzebezan24" Mizzi. Ignat "0Human0" Liviu then took care of "GVOZDIKA55" to move on, while "K_0_S_T_Y_A" finally felted Justin "ZeeJustin" Bonomo. Others moving on included "johnxfleming" who beat "OLD TIME GIN," Sami "Lrslzk" Kelopuro who beat Jonathan "Iftarii" Jaffe," and "Sussie Smith" who beat "wilhasha." Finally after two hours and 20 minutes of play, "Kanu7" had chipped "MaiseE" down to less than 4,000 when an all-in confrontation arose in which "MaiseE" held and "Kanu7" . A king flopped, "MaiseE" couldn't catch up, and they were on to the next round. All eight of the next round's matches began slowly, with the first winners not coming until an hour after they had begun. Ben "Sauce123" Sulsky was among the first through after defeating Ignat "0Human0" Liviu. Following close after were "Sussie Smith" who beat "raidalot" and Viktor "Isildur1" Blom who eliminated "akut." Over the next hour four more quarterfinal spots were claimed. "K_0_S_T_Y_A" defeated "Eunjong Byun." "johnxfleming" took care of Sami "Lrslzk" Kelopuro. "Also11" prevailed over "Kanu7," and Niklas "ragen70" Heinecker knocked out "Serkulues." That left just Bertrand "ElkY" Grospellier and Ankush "pistons87" Mandavia still playing, and the pair continued their battle into a third hour with Mandavia leading. Grospellier chipped back to close the gap, but Mandavia pulled ahead again and had Grospellier down to just 3,487 to his 16,513. That's when Grospellier open-shoved with , and after several seconds of thought Mandavia called with . The flop then brought an eye-popping — the nut flush for Mandavia — and Grospellier was already drawing dead. The last set of matches on Saturday pitted "K_0_S_T_Y_A" against Sulsky, "johnxfleming" against Mandavia, "Also11" against "Sussie Smith," and Blom against Niklas "ragen70" Heinecker. Unlike the previous round, this one saw three matches end relatively quickly. Within five minutes of the start of their match, Sulsky and "K_0_S_T_Y_A" were raising back and forth before the flop until the latter was all-in with against Sulsky's . The board ran out , and Sulsky was quickly through to the semis. Just a couple of minutes later, "johnxfleming" was six-bet shoving a stack of 9,183 with , and Mandavia (who had 10,817 to start the hand) called with . The board came nine-high, and Mandavia jacks held to make him another rapid winner and land him in the money. It took another 20 minutes or so before the next match was decided. Heinecker jumped out to an early lead versus Blom, and had chipped him down to just 1,677 when Blom called off the last of his chips following a four-bet push by his opponent, turning over to Heinecker's . The five community cards came , giving both tens but Heinecker the better kicker and the third semifinal spot. The fourth and final match of the day between "Also11" and "Sussie Smith" would take considerably longer, with "Also11" starting to push out in front as the pair moved well into the second hour. "Also11" had about a 2-to-1 chip lead when a hand arose in which a series of preflop raises put "Sussie Smith" all-in with against the of "Also11." The flop came to swing the advantage to "Also11," and after the turn and river "Also11" had won. Ankush "pistons87" Mandavia "Lottenice," Bertrand "ElkY" Grospellier, "johnxfleming"
“Also11” Scott "gunning4you" Seiver, "Kanu7," "Sussie Smith"
Sunday's semifinal matches will feature Ben "Sauce123" Sulsky taking on Ankush "pistons87" Mandavia on one side of the bracket, and "Also11" battling Niklas "ragen70" Heinecker on the other. Losers in those matches will take away $86,100 each, the eventual runner-up will earn $143,500, and tomorrow's champ will win a first-prize of $258,300. The "Medium" version of the big buy-in, two-day no-limit hold'em heads-up tourney sported a hefty $2,000+$100 price tag, and thus it wasn't surprising to see a lot of top names among the 256 who entered. Players making the Round of 32 made the cash in this one, which meant winning three heads-up matches. One more round was then played late Saturday afternoon to cut the field to 16. “grigorq77” "TheJunobv," Matt "ADZ124" Marafioti, "ac1dd"
Jami “Jamil11” Wakil "treezer," Taylor "tRaMp$d0PrAy" Paur, "JMPRODIGY"
"micide" Alex "AlexKP" Petersen, Josh "JBT449" Bergman, "betstreet"
Ben “Sauce123” Sulsky "flashdisastr," "JackRich," "brunson 777"
“Daheh” "Kanu7," Nick "GripDsNutz" Grippo, "Godders6"
"SnakeeJake" "SPEKTAH," Paul "paulgees81" Volpe, "THEDUTCH4141"
"maxv2" Luke "lb6121" Schwartz, Caio "caio_pimenta" Pimenta, "raidalot"
Sorel "zangbezan24" Mizzi "DerRaeuber," "12ziz12," "teddy wong"
“w00tLOL” "sur_type," Daniel "GotURead" Reijmer, "Luckbox4Life," "alexandrapau"
“OLD TIME GIN” Jonathan "Iftarii" Jaffe, Mark "SHIPP ITT" Herm, "VANISH2000," "grigorq77"
"Bohni16" "juilanherold," "LFmagic," "7tHEcROw7," "hnidel"
Vojtech "Vojta_R" Ruzicka "Kungfumonk," "Syous," "Soccermom96," "HonestPete"
"KRab42" "Rens02," "SmSL2010," "betstreet," "micide"
Chris “Moorman1” Moorman "hasankiki," Joe "ender555" Ebanks, "iJustGamble," "Daheh"
“Helio TYF” Allan "Sifosis" Baekke, Jim "Mr_BiqQueso" Collopy, Dan "Danny98765" Smith, "Festivuss"
"jama-dharma" "KuuL," "Jarcon86," "BERRI SWEET," "SnakeeJake"
"Banderivets" Brian "brianm15" England, "Raziel2689," Jack "jackellwood" Ellwood, "maxv2"
All 16 are guaranteed at least $10,752 for getting this far. Here are the Round of 16 match-ups: "w00tLOL" vs. "Lecher1991"; "OLD TIME GIN" vs. "C. Darwin2"; TJ "1BigAceHole" Ulmer vs. "Bohni16"; Vojtech "Vojta_R" Ruzicka vs. "KRab42"; "Lotte Lenya" vs. Chris "Moorman1" Moorman; George "Jorj95" Lind III vs. "Helio TYF"; "jama-dharma" vs. "Banderivets"; "Xereles" vs. "Fiskin1." A cool $112,640 awaits the player able to win four more matches on Sunday to take the Event #37-M title. Turnout for the "Low" version of this weekend's two-day heads-up NLHE event meant another guarantee-smashing prize pool, to be divided by the top 128 finishers. Among those making it to the Round of 128 before losing and claiming $735.28 paydays were Andrey "Kroko-dill" Zaichenko, Jonathan "Poker Own U" Bardier, and Jim "Mr_BigQueso" Collopy. Meanwhile the 64 returners tomorrow include a few familiar names such as Ben "delaney_kid" Delaney, Mike "goleafsgoeh" Leah, Rory "Mafews" Mathews, and Andrew "RunThisTable" Lichtenberger. All making it through to Sunday's matches are guaranteed at least $1,295.22, with the player able to survive six more heads-up duels scheduled to earn a handsome $42,768.04 first prize. The 85-player HORSE "High" tournament paid 12 players. Falling a tad shy of the final table but in the money were Bryn "BrynKenney" Kenney (9th - $4,675) and money bubble boy James "Andy McLEOD" Obst (13th). 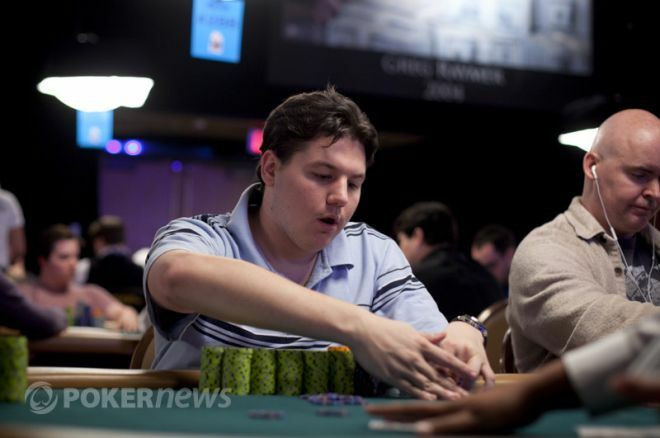 Shaun Deeb made the final table and was among the shorter stacks. Here were the counts at the start. George "Jorj95" Lind was the first to exit the final table, doing so at the 2,500/5,000 round of limit hold'em. Lind committed his final 4,051 with and found action from Shaun Deeb and Andrey "Kroko-dill" Zaichenko. The flop was checked by both. When the fell on the turn, Deeb isolated the pot with a bet and revealed to have the hand clinched. Jon "FatalError" Aguiar busted during 3,000/6,000 Omaha hi/lo. Short stacked, Aguiar called a raise from the big blind with and bet the rest of his chips on the flop. The final board read and the of Zaichenko took it down with top two pair and no low in play. "Sivokhan," who led at the start of the final table, finished a disappointing sixth. During 3,000/6,000 Razz with a 600 ante, "Sivokhan" was all-in after sixth street with / against the / } of Jon "LUFCBas" Spinks. Both started out well, but were only playing king lows by this point. Spinks hit a on seventh to barely improve with queen low, while "Sivokhan" paired a to hit the rail. Andrey "Kroko-dill" Zaichenko fell a few hands later. He made a stand with / , but was calling from behind fifth street and on. By the time it was over, his final hand of / / fell to the / / of Alexandre “BiatchPeople” Luneau. Deeb completed third street then called Luneau's raise. Deeb then led out on every street thereafter with Luneau calling the entire way until raising all-in on seventh street with underneath for a backdoor flush. Deeb, though, called and tabled for a full house. Dylan "ImaLucSac" Linde exited during 4,000/8,000 stud hi/lo. He got his short stack into the pot and revealed / , trailing the / of Shaun Deeb. Linde pulled a on sixth street to pick up a low draw, but the on seventh was a complete miss for him, ending his run in third place. Deeb began heads-up play with 252,879 to Spinks' 172,121. Deeb closed it out at 5,000/10,000 hold'em. Having whittled Spinks' stack to less than 5,000, Deeb closed it out after calling a Spinks button raise. The flop was check-called by Deeb. The hit the turn and Deeb put in a check-raise, leading to a Spinks re-raise. The cards were on their backs shortly thereafter and Spinks tabled . Deeb showed and notched his fourth win of the series when the river fell. David "Betudontbet" Emmons (17th - $902.55), Mike "SirWatts" Watson (18th - $902.55), Scott "BigRiskky" Clements (27th - $711.10), Tim "TurnRiva" Marsters (30th - $711.10), and Rodrigo "caprioli" Caprioli (34th - $574.35) were among the notable finishers in Event #38-M. Topping the field was "Drew M Scott," defeating a tough final table in the process for a $20,676.60 first-place prize. A four-handed deal took place in the Event #38-L, with "DaniRiquelme" taking it down for $10,250. Getting close to the final table were Kevin "iacog4" Iacafano (16th - $348.60) and Sorel "zangbezan24" Mizzi (18th - $265.60).